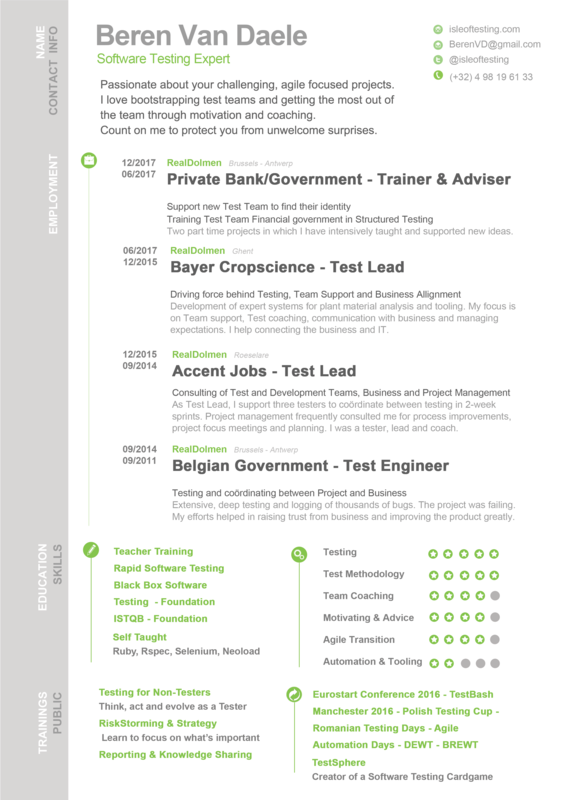 The day was 17th of April, 2015 that I mailed Rosie of Ministry of Testing with an idea I had. The question I posed was whether a Testing Tarot Card deck would be something the community would be interested in. Rosie had thought of something similar before and wanted to work with me on it. I wanted to create a tool that is generic enough to suit most contexts and can guide testers to find new and exciting ways to approach the product under test. I started developing something that eventually took the form of a Testing Tarot set. One side is always printed with one/same logo/design. The other side is printed with the character. I had already created a list of concepts that would spark inspiration for your testing and connected this with a Tarot-style character. The next step was finding someone who could draw beautiful characters and designs for the cards. After contacting several people, we found out that this would be very, very costly. So we decided to go with someone from Fiverr.com who we’d heard good things about. After completing about 20 drawings for us, she took 175$ and then vanished into thin air. We had less than half a card deck in a particular style which we couldn’t build on further. Rosie had invested that money for nothing. While waiting for the characters to come in, I had created a website to give a better overview of the card deck. This drove me into playing around with colours, logo, icons and a name. Asking advice from people around me, I found someone who wanted to build this into an app. To help inspire you, TestSphere doesn’t just give you an objective. gives several examples of how to test the objective. At that point, we were a year later already. January 2016. I hadn’t heard as much from Rosie as she was busy with the many other projects. In retrospect, she was right to do so, because I was still searching. Even if I didn’t know that about myself at the time. That same month, I was lucky to join 25 other testers on a peer conference: DEWT 6. I pitched the concept, the website and the app to them. They felt it had potential, but that it wasn’t quite there yet. While they were offering constructive criticism, help, support and ideas, I was feeling demoralized. A stone had formed in my stomach. That was the second blow. Driving home again, I started to get new ideas. Back to basics. A card deck that wasn’t a fluffy fortune telling game, but a useful tool of learning and knowledge sharing. Again I rethought the list of concepts, form and design of the card deck. I introduced different dimensions and investigated more concepts to add to the deck. Real, useful and specific test related concepts that have the potential to get testers passionately talking and thinking. The focus shifted from fortune telling and test ideas to learning and knowledge sharing. I pitched the new idea at TestBash Brighton as a 99-second talk and that was the moment it got picked up in earnest. Rosie wanted to get it ready for TestBash Manchester. Marcel Gehlen tested out the game and offered a boatload of feedback. In total: We liked the cards very much, we have some ideas how we can integrate them in our team / work and we think they add value. For gaming purposes we wanted more rules. If you ever come up with a stricter gaming rule set we are happy to try that out for you. We further expanded on the cards, with examples that approach the concepts from different angles. A real designer from MoT, Thomas Harvey, joined in and made it look awesome. This is a product that can be used in many different ways and taps into your experiences, potential and creativity. Whether you are an experienced developer or junior tester, this game will have you dig deeper and learn from each other. TestSphere brings out the potential in you. Rosie, Marcel Gehlen, Melissa Eaden, Thomas Harvey, Dwayne Slootmans, Bert Lerno, Ben Van Daele and my wife. Ministry of Testing have invested £20,000 for design, printing and handling. In order to make that money back, we’ll need to sell about 1,000 card decks. At the moment of writing, we’ve sold 220. You can help us take this story further. Inform your manager, your development team, your marketing team. Get them excited about TestSphere. Get it at the Ministry of Testing Store. An extension on the Ministry of Testing Dojo, a great library of real life stories? All we know is, this is far from over. We’re taking this further! Last Friday was TestBash Manchester and I’ve enjoyed it thoroughly. All these speakers, listeners, organizers, attendants,… make you feel right at home. They are what make every edition of Test Bash legendary. This time, I got the privilege of meeting a whole ton of them while handing out a new card game Rosie and me put together. TestSphere is an idea that has been worked on for two years, has seen 5 different implementations and eventually came alive as a 100-card card deck. A hundred cards, each featuring one keyword that has something to do with testing. That’s it! 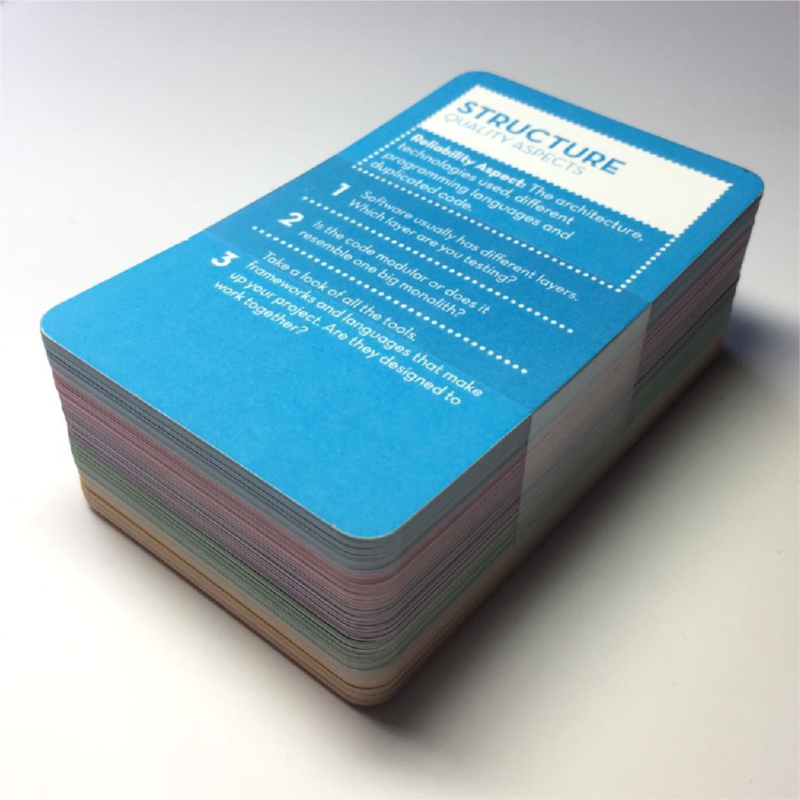 One hundred cards full of test-vocabulary and inspiration. Can you already imagine how you could use that? Step 3: Ask: “How has “Equivalence Partitioning” affected your testing? Do you have a story or experience to share about that? What follows is that person thinking a few seconds and eventually give you an interesting story that is the beginning what possibly is a good discussion on that keyword. Another thing that could happen is the person not understanding what you mean. This gives you the opportunity to practice explaining your testing. Either way, you’ll have started a discussion where you can coach, teach and learn at the same time. Additionally: Just keep the cards on your desk at work. Developers, Business people, Managers who come to your desk will say “Ooh, shiny colours! What’s that?”. Before you know it, you’re teaching your coworkers a thing or two about testing. Step 7: Other people can also tell their stories to get unrevealed cards for half points. The person that gets X points first or most points by X time wins. Easy right? You’ve just gotten a whole group of people thinking deeply about their previous testing experiences and put those experiences to verse. Additionally: After or even during the game identify opportunities for coaching and helping the others. Point them to resources or people who might help them get more insight. The RiskStorming game is a visual, collaborative method to map your Test Strategy on threats to the quality aspects that matter. 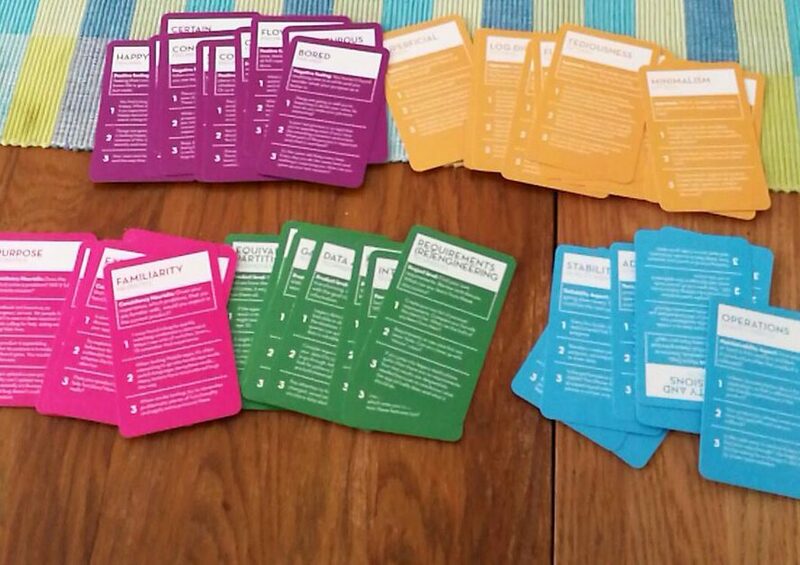 Also, at the bottom of that blogpost are printable boards for RiskStorming! So you find yourself bored, blocked, sad or stuck? The best thing you can do at those times is learn something new. Can this idea infuse your testing in a new way? Have you tried the “too many” heuristic? Have you tested the “Accessibility” Quality Aspect? Could you try doing some “Pair Testing” Techniques? Try exploring your product by applying “force” in creative ways. How would an “Irritated” or “Angry” user use your application? Additionally: If you don’t know the word on the card, or feel you don’t know if well enough: try to find more opportunities of learning about the concept! TestSphere has been deliberately kept free from rules. I believe testers are creative enough to find use cases on their own and decide for themselves which ones are valuable and which are not. The only constant is learning from stories and experiences. From your own and from those around you. We’re not quite ready for mass distribution. We’re still feeling out the market. However, there will be an option to pre-order one or more decks in the future.